Maybe a bit too big? Put this on your shopping list and you may have to lodge a planning application to extend your house, because at 65-inches this is the UK's biggest plasma TV. Sharp currently makes a 65in LCD, but Panasonic's flagship TV is confirmation that in the new age of high-definition TV, bigger is much, much better. Those HDTV broadcasts from Sky and Telewest are coming into our homes in seriously high resolution, and this TV not only has the resolution to match them pixel-for-pixel, but also the size to really do them justice. 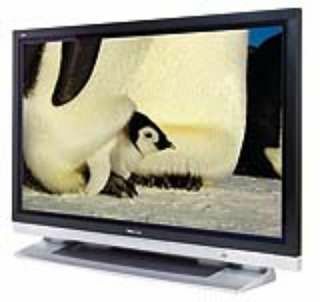 Offering a surprisingly good performance with DVDs, this seriously expensive TV is so well-endowed with picture integrity and black response that it's got to be the finest TV around. A sole HDMI port might disappoint, but all complaining ends right there.